Home/Posts/A Big Thank You from Vembu! A Big Thank You from Vembu! This Thanksgiving, like every other, we have a lot to be thankful for. It’s the season of gratitude, and we at Vembu would like to say a BIG THANK YOU to each and every one of those who have supported us throughout our journey. A special Thank You to our customers and partners out there, without whom we couldn’t have secured ourselves a space in this niche market. Data is something that is vital to every business. For, without data, no business can ever exist. Hence, data protection is a major concern for every system administrator. The responsibility of ensuring data availability falls solely on the admins. They have numerous sleepless nights worrying about the data breach and thinking of strategies to repel attacks on their data. And for bearing this crucial role, every IT admin deserves a big clap on the back! 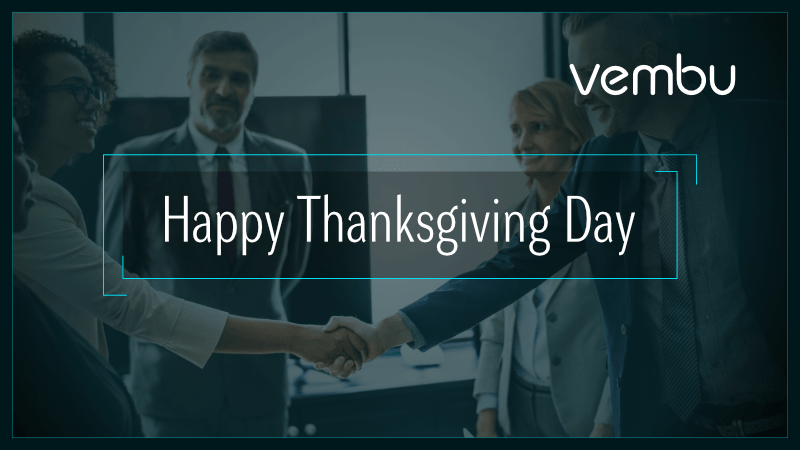 We from Vembu would like to extend our sincere gratitude to every single IT administrator out there. BCDR is no longer something that SMBs can’t think of, for it has begun making its way into every business sector. No matter the size of the business, the threat of data loss is real. With that in mind, Vembu offers the BDR Suite, using which businesses can protect their workloads running on any environment. Be it physical, virtual or the Cloud, data residing on it can be protected from a single console with Vembu. Vembu provides solutions to backup VMware, Hyper-V, physical Windows machines, MS Applications, etc. The backup data can be stored in your own premises and can be replicated to an offsite location – like your own data center or to Vembu Cloud. Vembu has got you covered, whether you’re a small business running a single server or a huge enterprise running hundreds of machines in your data center. This Thanksgiving season, as a symbol and mark of our gratitude, we are excited to offer you up to 40% off on all Vembu products until 24th December 2018. As the year winds down, we take this opportunity to thank you for walking with us through thick and thin. And to all those who have shown interest in our product and given us recognition, we would like to extend our heartfelt gratitude. Vembu wishes you all a great Thanksgiving weekend ahead! Got questions? Email us at vembu-support@vembu.com for answers. Product Analyst at Vembu Technologies. A Bibliophile with a passion for writing. I'm a simple and outspoken person who believes that great things can be achieved by having a strong conviction.